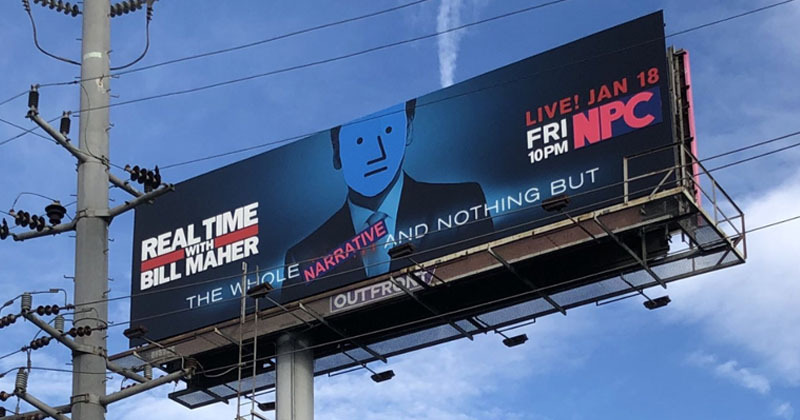 From Hollywood Reporter: Bill Maher on Sunday was attacked on a giant billboard that accuses him of not being “real” or “politically incorrect,” but a liberal apparatchik of prevailing wisdom ahead of the return of his HBO show, Real Time, on Friday. The billboard, at the corner of La Cienega Boulevard and Holloway Drive in West Hollywood, is the work of a group of conservative street artists known as The Faction, who previously peppered the Hollywood Walk of Fame with dozens of faux Donald Trump stars to make up for the real one that the president’s detractors have destroyed on multiple occasions. NPC was hijacked as a conservative meme a few months ago, used often to demean left-leaning, mainstream journalists. Gamers use it to refer to characters that are programmed for simple reactions and to give advice and directions, and not much more. “For progressivism’s tragic devotees at HBO, sadly, the idea that they’re still speaking truth to power survives in the form of fan fiction like Real Time With Bill Maher,” a spokesman for The Faction told The Hollywood Reporter. The Faction are a group of conservatives who will not reveal their identity. This entry was posted in Donald Trump, Hollywood liberals, Humor, Liberals/Democrats/Left, Media, United States, US Presidents and tagged Bill Maher, HBO, NPC, The Faction. Bookmark the permalink. I never found Maher to either be funny or politically incorrect. On the contrary, he is the epitome of the Left’s “political correctness”. The man sleeps with satan he is a terrorist in my book nothing more. He needs to be held accountable for what he has done. That’s excellent, and true. I can’t stand the guy. He’s not funny and he’s an arrogant, rude Jew. His main purpose is to sustain the notion that all conservatives, or independent thinkers are stupid. The guy never had an original thought in his head. He is hired by his owners as a gate keeper and that’s what he does. I will say the face of the NPC is actually an IMPROVEMENT! Once in awhile, Maher has his moments of clarity. NPC = Non-player character. Not non-playable. Those of us having an internal dialogue are not “playable” lol.